There have been a lot of theories and rumors over the years about oil pumps and gear size. I will try to explain to the best of my knowledge and ability. There were at least three primary revisions of the 4AGE oil pump gear though there may have been more subtle changes over the years. The first gear was a square tooth design. That was replaced by a round tooth design. The first round tooth gear was approximately 7.5mm thick. This is also identical to the gear found in the 7AFE oil pump. This pump having the same gear profile and being 22% thicker will move 22% more volume. This is great especially for high performance motors using looser bearing tolerances and needing more volume. For a long time there were rumors that only the Toyota pumps had the thicker gears. This is not true. 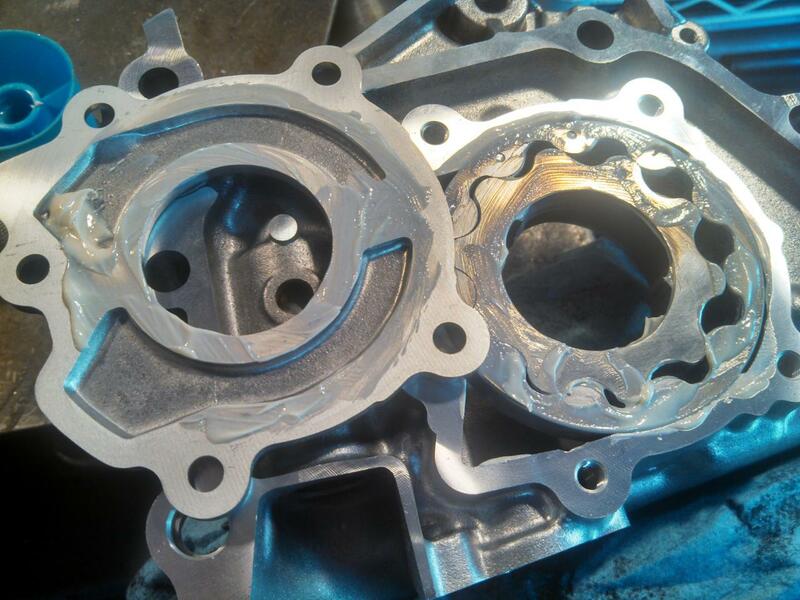 We only get Aisin oil pumps and know for sure that modern Aisin pumps use the later gear. We are not sure about other manufacturers pumps though. It is however hard to know for sure you are getting the later revision gear. They share the same part number so it could be possible to get a part that has been sitting on a shelf for decades that is the old style. For this reason we offer the option to inspect your pump before it's shipped to make sure you are getting the later high volume pump. We will also grease it up with assembly lube so it's ready to install when you get it. 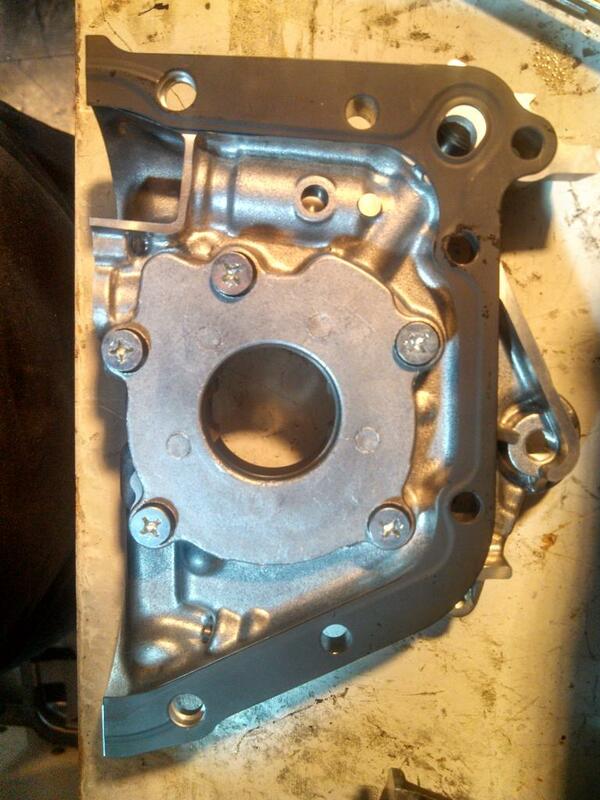 You can get an Aisin pump here and there is the option to get it inspected when you order. This procedure may void AIsins Warranty. That is your risk, not ours. If there is anything that is obviously related to the service we will do what we can to resolve the situation. You can also inspect and lube up the pump yourself. Using grease or assembly lube is recommended any time you install a new pump. This keeps it from galling up on first startup and also helps the pump prime sooner. To inspect and lube the pump first remove the front cover and take the gears out. Measure the pump gears as shown in the picture above. If the gear measures just under 9.5mm you have the later gear. Next clean the entire pump. Make sure the gear housing is spotless. 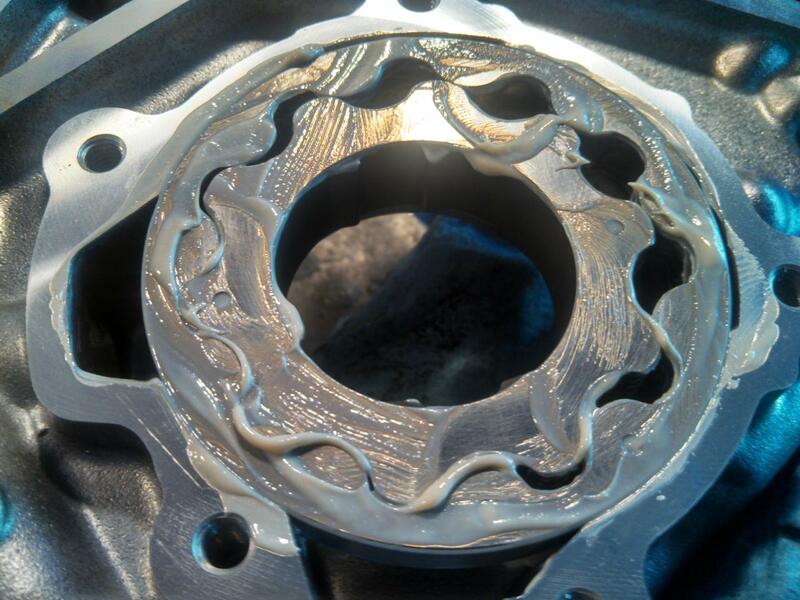 Apply grease or assembly lube to all surfaces that contact the gear and also a dab at the inlet ramp. Install the inner and outer gear then smear some grease inbetween the teeth and then spin it by hand a few times to spread the grease in the gears. 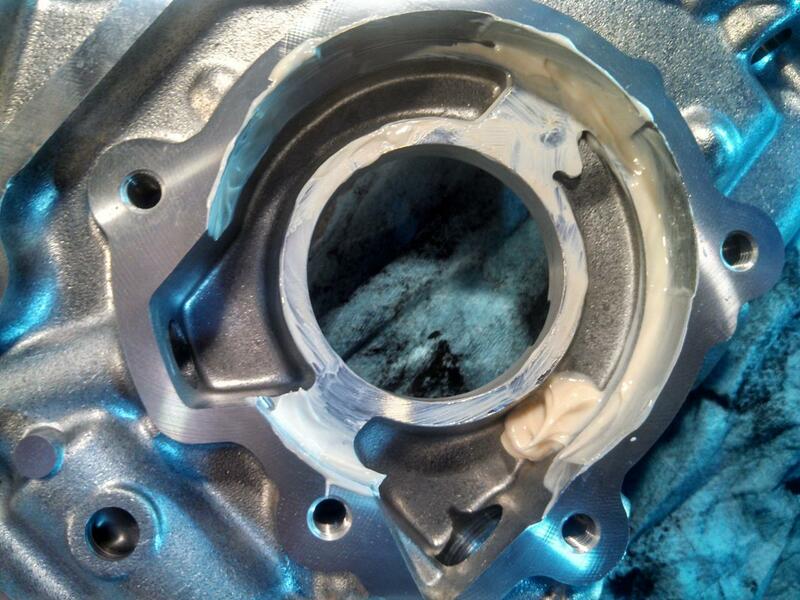 Apply some grease to the cover where it contacts the gear and add a small dab at the inlet ramp. Torque the bolts in a star pattern first to 66 in lb (7.5 NM) and then to 100 in lb (11.2 NM). 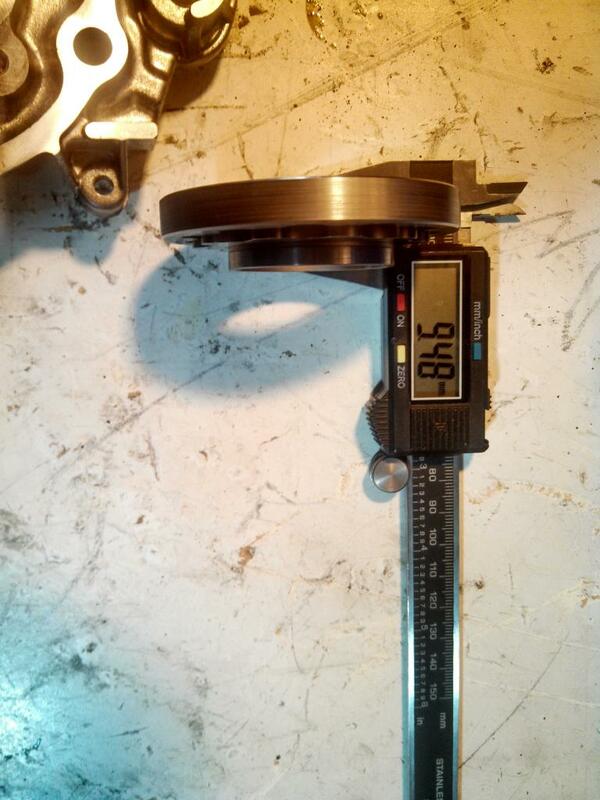 Then I do a pass clockwise or counterclockwise at the same torque just to make sure they are all good. Now your pump is ready to install. 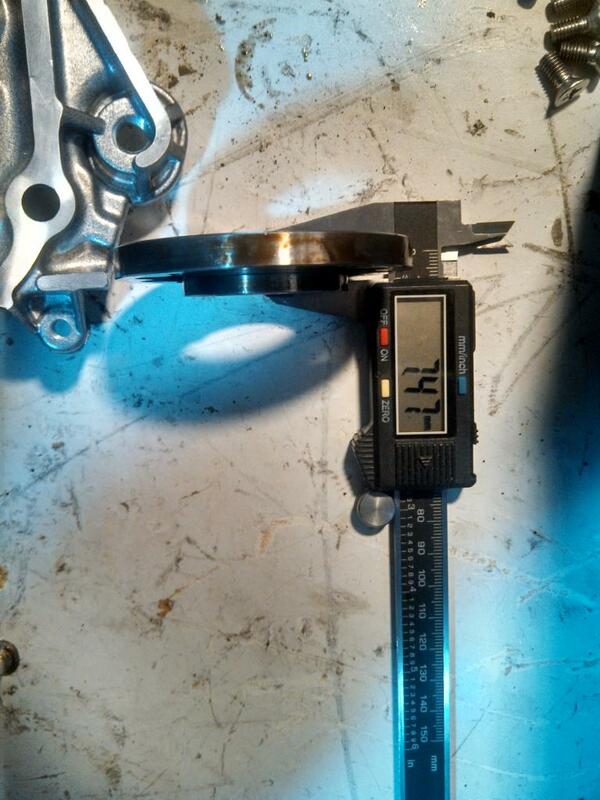 The stock sintered gears have been known to fail if they spend extended periods over 8500 RPM. For high RPM builds you should install the Toda oil pump gear. This gear fits the later high volume pumps.